Learn about how LOB apps will work with Windows 10 while Pracheta talks about IE11 interoperability with Edge. Follow her at @prachetab if you are interested in Enterprise, Cloud & Datacenter best practices. 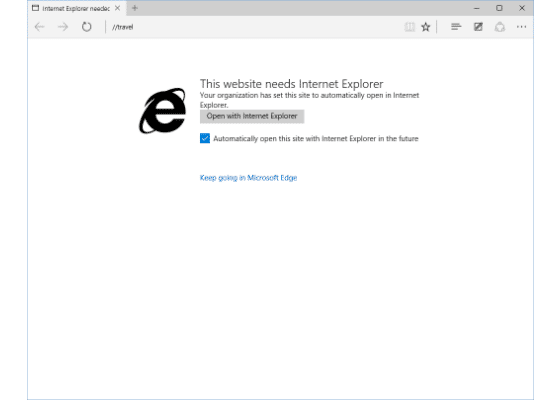 In this article, we’ll go in detail about how you can use Enterprise Mode with Microsoft Edge to open Internet Explorer 11 for your business’s sites that require IE’s proprietary technologies. This approach enables your users to run a modern browser designed for better productivity, security, and rendering web pages—without sacrificing compatibility with legacy line of business applications. If your environment depends on few legacy features that only available in older versions of Internet Explorer, it’s important to be are familiar with Enterprise Mode tools for IE11. Enterprise Mode support is available for Microsoft Edge. You can open any site specified on the Enterprise Mode Site List in IE11. IT Pros can use their existing IE11 Enterprise Mode Site List or they can create a new one specifically for Microsoft Edge. By keeping Microsoft Edge as the default browser in Windows 10 and only opening legacy line of business sites in IE11 when necessary, you can help keep newer development projects on track, using the latest web standards on Microsoft Edge. One can also configure any Intranet site to open in IE11 when a user browses to it using Microsoft Edge. This functionality is available as part of Windows 10 and has no additional installation requirements. The user is prompted to open the website in Internet Explorer 11 (with the option to default to Internet Explorer in the future), but can choose to continue in Microsoft Edge. Selecting “Open with Internet Explorer” will start Internet Explorer 11 and navigate to the current page in a new window (or a new tab if the browser is already running). For Internet Explorer 11, Enterprise Mode is configured by enabling the Use the Enterprise Mode IE website list Group Policy. You must then specify the location (URL) of the Enterprise Mode Site List under Options. 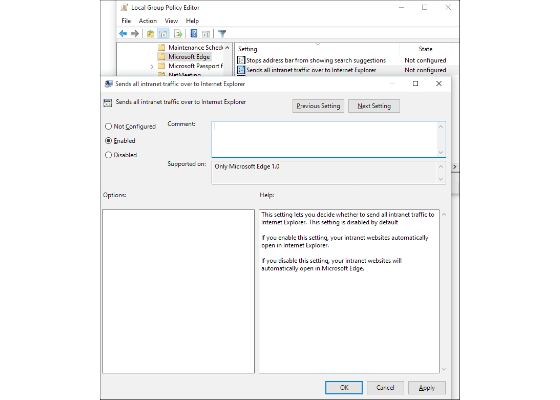 You can configure Microsoft Edge in a similar way using the Microsoft Edge Allows you to configure Enterprise Site list Group Policy. 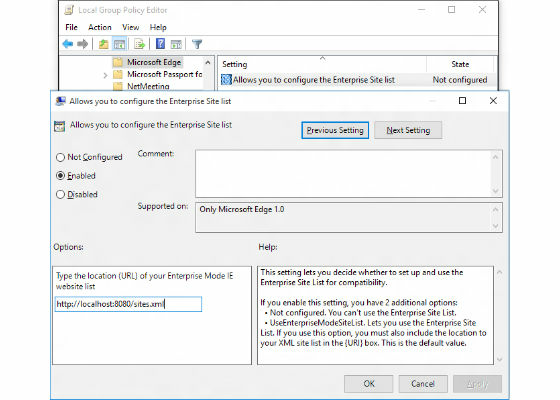 That Group Policy specifies the location of the Enterprise Mode Site List for Microsoft Edge. 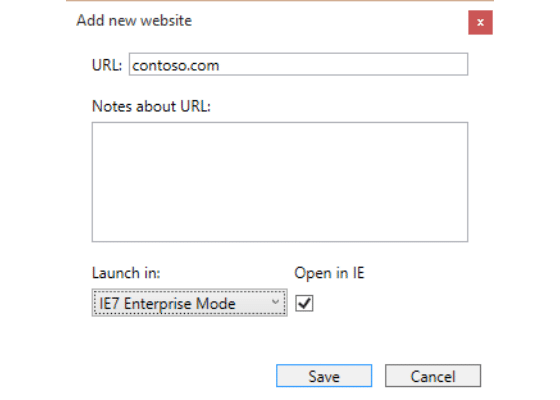 If you enable this policy but do not specify a location for the Enterprise Mode Site List, Microsoft will automatically use the IE11 Enterprise Mode Site List if one exists. By default, any site that is in the <emie> or <docmode> section of the Enterprise Mode Site List will automatically open in Internet Explorer 11. Additionally, we are introducing a new attribute “DoNotTransition” which allows explicit control over whether Microsoft Edge will open a site in Internet Explorer 11 or not. The doNotTransition attribute can also be set using the latest version of the Enterprise Site List Manager. When an existing site list is imported into the latest version each entry will receive an explicit DoNotTransition=”False” setting. This is shown in the UI via the “Open in IE/Internet Explorer” checkboxes. These are found in both the Site Detail and Site List view. Microsoft Edge and IE11 can share the same Site List, or you can specify separate lists. 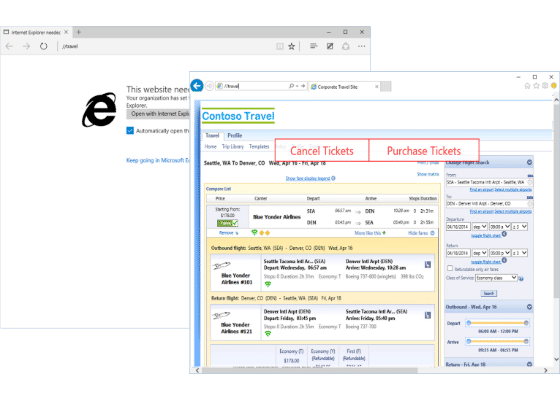 In addition to using the Enterprise Mode Site List, Microsoft Edge can be configured to send all Intranet sites to Internet Explorer 11. You can do this via the “Sends all intranet traffic over to Internet Explorer” Group Policy. If this policy is configured, it will send all intranet sites to IE11, not just the sites listed in the Enterprise Mode site list. This option provides the same user experience covered earlier. 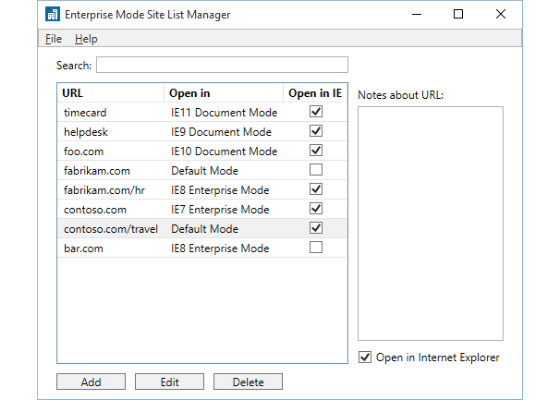 We recommend IT Pros use the Enterprise Mode Site List—and not this policy—to configure just the minimum set of sites that need to open in IE11, as it will help enable you to modernize your intranet sites for Microsoft Edge more quickly. When configured, any site that is identified as being on the company Intranet will be automatically opened in Internet Explorer 11 when visited in Microsoft Edge. In case you’ve significant LOB application dependencies on IE11 and legacy IE technologies, you can set IE11 as your default browser on Windows 10 using the Set a default association’s configuration file Group Policy. However, we recommend against this approach to ensure that sites which don’t rely on legacy technologies get the most modern rendering via Microsoft Edge. This feature is available in Windows 10 Build 10240+, so no additional updates are needed. 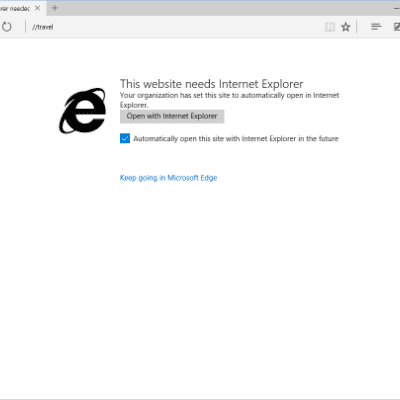 If you are already using Enterprise Mode to address compatibility issues in Internet Explorer 11, all you need to do is configure Microsoft Edge to use your existing Site List. Below are some additional resources. • Download the new Enterprise Site List Manager Tool – v4.0 (Summer 2015).